Join Sumatra Adventure Holidays for your adventure of a lifetime! Are you looking for a holiday where you can get back to nature and to immerse yourself in the local culture? 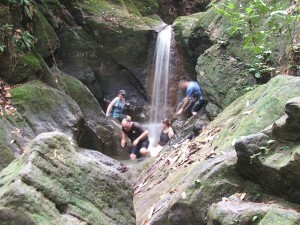 Sumatra Adventure Holidays is proud to be a locally owned and operated sustainable ecotourism company. All of our profits are reinvested in the local communities we visit, volunteer in and work with. 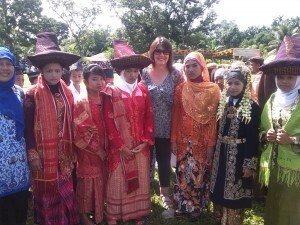 Sumatra Adventure Holidays specialises in flexible private small group tours and treks in North Sumatra. Our longer tours and day trips and treks, include wildlife and orangutan treks in the sumatran jungle from Bukit Lawang, Tangkahan Elephant washing, Berastagi village and volcano tours and Lake Toba tours. We are very honoured to be the first Sumatran ecotourism business to be a member of the Pack for a Purpose Program where visitors have the opportunity to give something back to the local school communities that they are visiting. We would love you to come and join Sumatra Adventure Holidays on one of our eco-friendly Sumatran orangutan treks and wildlife treks in Bukit Lawang Gunung Leuser National Park, or Sumatran elephant washing Tangkahan. Try climbing a volcano at Berastagi, chill out at Lake Toba, or explore the culture and villages in the new ecotourism areas of Batu Katak, Selang Pangeran and Batu Kapal where you can help with tree planting reforestation projects or volunteer to teach English to the local children. There is no better way to experience the wilderness & natural beauty of North Sumatra than on one of our safe personalised private small group tours on your very own adventure. You can choose one or a combination of our tours or treks, or contact us to tailor your very own trip to suit the time you have, so you do exactly what you would like on your holiday on the dates that suit you. Our guides are all fully licenced, highly experienced English speaking local Indonesians with many years trekking and touring in northern Sumatra. So don't wait a minute longer, join us for your Sumatran adventure of a lifetime and live your dream! Check out our Special Departure dates over the Christmas and New Year holidays here. Departing 26, 27, 28 December 2017 and 5,6,7 January 2018. Or contact us about arranging your own small private group tour over the holidays. We have a tour to suit everyone! We offer the largest and most diverse range of nature based and cultural tours in Sumatra, traveling to remote villages of Bukit Lawang, Tangkahan, Batu Kapal, Selang Pangeran and Batu Katak, Lake Toba and Berastagi; including market visits, village walks, school visits, indonesian cooking classes, white water rafting,tubing, hots springs, waterfalls and caving just to name a few! All of our tours include national park permits and experienced licenced English speaking guides and are available every day of the year. If you have are traveling in a group of 2 or more, you can choose any of our tours to start on a date that suits you! CHECK OUT OUR GROUP TOUR DATES HERE! Whether you are wanting to go on a half day, one, two or three day orangutan and wildlife trek, a 3 or 4 day river and village walk, a 5 day family fun jungle trek or a 7 day Sumatran jungle trek, or our extreme 6 or 10 day volcanoes, rafting and trekking adventure, we have the perfect trek for you! We will tailor your trek to meet your interests, fitness levels and the length of time you have. 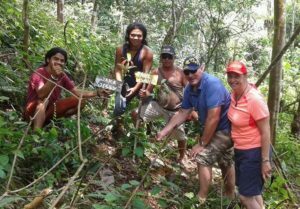 Our village and river treks can include staying in villages along the way to teach English to the local children and plant trees as part of the local reforestation program. One of our most popular treks, our 7 day Nature Meets Culture Trek, combines a 3 day jungle trek with our 4 day river and village walk. Our 6, 7 and 8 day GROUP TREKS run every Friday, Saturday and Sunday! CHECK OUT OUR GROUP TREK DATES HERE! Build your own tour and have a flexible holiday that suits you! If you want a flexible holiday and would like to choose your own activities we would love to help! Just choose from the activities here and we will put a tour or trek together for you on the dates that suit you! 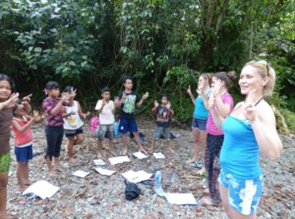 We offer the largest and most diverse range of nature based and cultural activities in Bukit Lawang and North Sumatra, including market visits, village walks, school visits, indonesian cooking classes, orangutan treks, river walks, jungle treks and caving just to name a few! Our activities are available every day of the year. Please contact us and we will help you plan your amazing Sumatran adventure. So don't wait a minute longer,contact us today to plan your Sumatran trip of a life time! Are you keen to go on a holiday where you can visit the local villages and give back to the local communities that you stay in? Sumatra Adventure Holidays is involved with a number of locally run volunteering programs, where you can help teach English to the local children or participate in the Batu Kapal Conservation Program, assisting with environmental surveying and animal monitoring or planting trees as part of the Orangutan Biolink Wildlife Corridor Program. These can either be included in your tour or trek to Sumatra or you can arrange to come for an extended time to help with these very worthwhile programs. OUR VOLUNTEERING PROGRAM IS FROM $30 US A DAY (FOR ACCOMMODATION AND 3 MEALS A DAY). WE ARE FLEXIBLE, COME WHEN IT SUITS YOU BEST! 2017 and 2018 VOLUNTEERING OPPORTUNITIES. COME AND HELP WITH ENVIRONMENTAL AND ANIMAL SURVEYING, WILD LIFE CORRIDORS AND HELPING TO TEACH ENGLISH TO SCHOOL CHILDREN JUST $30 US A DAY FOOD AND ACCOMMODATION (including 3 meals a day, tea, coffee and water, bed)). YOU CAN COME ANYTIME THAT SUITS YOU BEST! Sumatra Adventure Holidays is proud to be involved with a number of locally run community education and environmental programs, where you can help teach English to the local children at the Selang Pangeran and Batu Katak Volunteer English Schools or you can make a positive contribution to protect the environment in the Batu Kapal Conservation Buffer Zone Program, by participating in environmental mapping and animal surveying or planting trees as part of a Orangutan and Wildlife Corridor Biolink Project. These can either be included in your tour or trek to Sumatra or you can stay and volunteer for an extended time to help with these very worthwhile programs. If you would like to participate in any of Sumatra Adventure Holidays volunteering initiatives or make a donation for school supplies for our English School House, please contact us at enquiries@sumatraadventureholidays.com and we will be happy to make the arrangements for you as part of your adventure to Sumatra or your students gap year.